A couple of weeks ago we headed up to Belfast to the Ulster final of the Irish Restaurant Awards, a region which has seen a huge explosion of new eateries in the past eighteen months. Belfast in particular has firmly placed itself on the map of top end dining experiences with the likes OX, Deanes or James St South. Michael Deane, a veteran in the industry has expressed a renewed desire to chase the coveted Michelin star once again with EIPIC and stated how he has seen a big upturn in the city. All good indicators food is something people are once again excited about, in particular dining out. With that in mind we booked a very early table at Stix & Stones right in the heart of the city and very centrally located, a “stones throw” from The Deane’s empire. Opened in May 2014 by two brothers Executive Chef Dan Courtney with Head Chef (and brother) Marty, who have a huge amount of experience in Dublin and Belfast restaurants. Most notably Rustic Stone, which appears to have heavily influenced the menu. We arrived at 5.oopm on a Tuesday just as the restaurant was opening. It is pretty evident a huge investment has been put into the building. The finish is excellent, high quality wood panelling, exposed brick and a mix of contemporary leathers match perfectly against the rich dark wood backdrop. First impressions were very good. The guys have installed a focal point cocktail bar, well stocked, very slick and even has a bearded mixologist to boot ! We were seated close enough to the open plan kitchen, busily prepping for the night ahead and at this point were the only diners there. We ordered a couple of Woodford Reserve ” Old Fashioned’s” and had a wee look at the menu. The menu unsurprisingly has an excellent beef selection for on the stone as well as rump of lamb or tuna steaks. If preferred the kitchen will cook to your liking but I would urge you to try the stone experience and the flavours are amazing. They also have a super selection of alternatives like baked halibut, roast monkfish, venison casserole, etc. Unfortunately we were seated under a heater which appeared to be on full blast so we asked to move seats but were told all tables were booked, so no ! As the restaurant was petty much empty we felt this was quite poor. That said within 20 -30 minutes of us arriving all tables were indeed full and in fairness the front of house, who was very pleasant about it, offered to turn the fan down so all was redeemed! So on to the food. We were on a tight time frame so we skipped starters and went straight for mains, Baked Halibut with buttered kale, toasted pine nuts, pancetta, red wine butter sauce. Beautifully presented on a seasonal bed of perfectly seasoned kale, the halibut with a crunchy bite a perfect contrast the the delicate fish beneath. We couldn’t come to Stix and Stones and not experience the steak on the stone, so a 8oz Fillet of beef for the lady it was. All steaks are served with wild mushrooms and truffle ragu, beetroot relish and slow roasted tomato and a choice of sauce, in this case a whiskey peppered sauce – divine! The ideas behind the stone is explained by our waiter, that being the meat is sealed and then placed on the stone, brought to the table sizzling and cooked to your liking. The advantage of this slicing of the beef and placing on the stone is mouthwateringly succulent meat and some of the best steak we have ever experienced. Being the greedy feckers we are, we decided on a side of sweet potato wedges with a super smoked paprika mayo. All in all two thoroughly enjoyable mains. With minimal room left for dessert we shared an old time favourite Seasonal Berry Trifle. 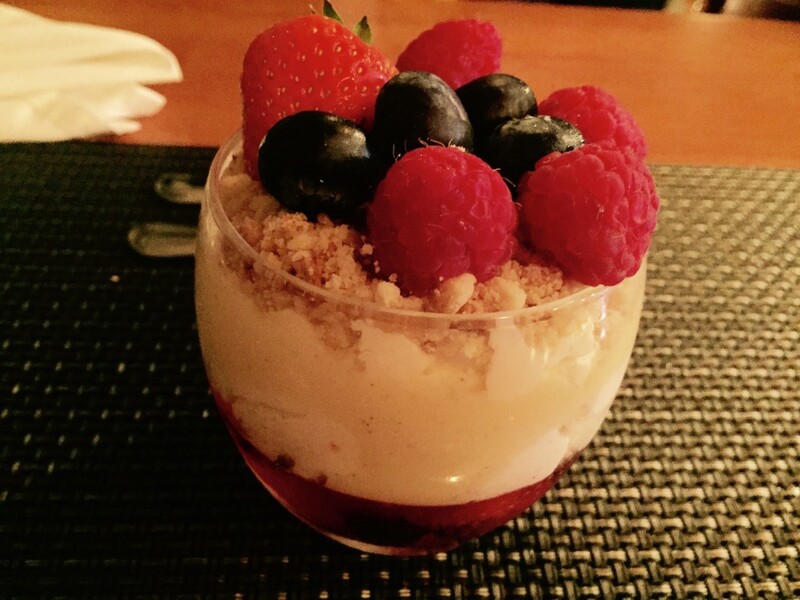 A stunning blend of rose water jelly, rich mascarpone cream and topped with delicate almond crumble and juicy berries, only complaint was we didn’t order two, there’s always next time. Total bill came to £67.90 excluding service, we felt this was excellent value for both the portion sizes and quality of the produce on the plate. Stix & Stones has definitely placed itself firmly on the food lover’s map and is well worth a trip to Belfast to experience it’s fantastic fare. This is a Northern Taste we highly recommend.